A lot of fiction, a little science fiction, and some nice cookbooks. If you’re traveling through Texas on Highway 79, and you find yourself in Buffalo, you could do a lot worse than stopping off at The Horse’s Mouth bookstore and coffeeshop. Besides coffee, they have a huge selection of ice cream flavors to turn into shakes, and, of even more importance when traveling, they have a nice selection of used books to walk around and browse. After several hours of driving, why stop at a coffeeshop that expects you to sit down? 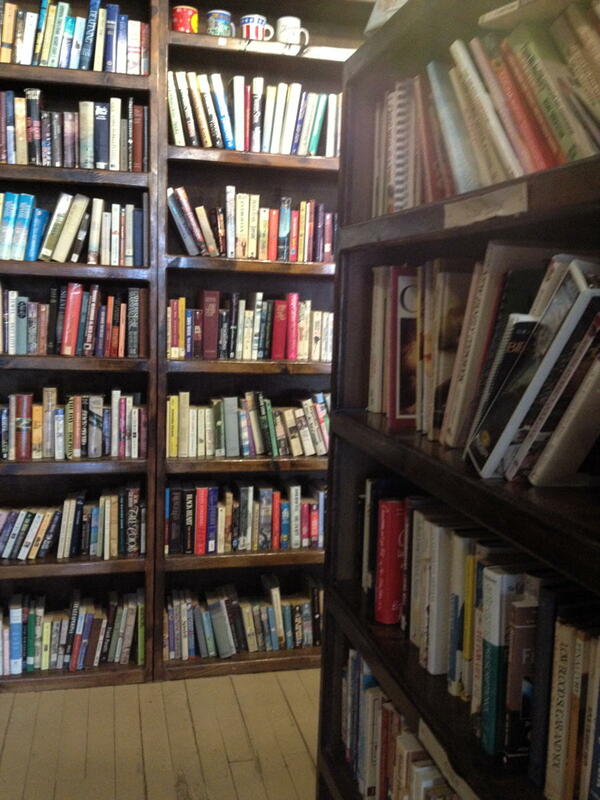 While the book side has a relatively small selection of used books for a bookstore, it has a big selection for a coffeeshop/bookstore. I was on my way to Palestine—and another booksale—when I stopped here, and I even managed to find a book I’d been looking for, Brad Thor’s The Lions of Lucerne as well as a hardcover of Ken Follett’s On the Wings of Eagles. I read the latter in paperback form a long time ago and have been wanting to re-read it. Lions of Lucerne is the first book in the Scot Harvath series; I read the tenth book, Full Black, a few years ago, and liked it enough I picked up another at random; it turned out to be the ninth in the series. I have a tendency to do this: randomly pick out a book that’s in the middle of a series, than read backwards. I decided this time to stop reading any more in the series until I could find the first. Now I have it, so I’ll be digging into a long thriller series. They had a small selection of nice science fiction and fantasy, and also a shelf of very nice cookbooks. Again, not many, but what they had were good books. They had at least three of the Southern Living series from the seventies, which is one of my favorite series of cookbooks. I think they’re other people’s favorites as well, since they rarely show up in used bookstores. Alas, all of the ones here were ones I already own. It looks like from their web page that they run a local writers conference, too, although I don’t see any information about it. FYI, my navigation unit thought it was on the other side of the street, so if you don’t see it where your navigator says to look, look across the street. The only drawback to the bookstore is that the stickers they put on their books are nearly impossible to get off, even with a blowdryer. I don’t mean to single out The Horse’s Mouth for this, because about a quarter to a half of all used bookstores do this. One of the reasons to buy books from bookstores rather than buy ebooks is because you like to hold a book in your hand, and see the physical object. Not just for the text, but for the cover art and author photos as well. Having that right in your hand is a benefit—or a potential benefit—of buying from a local bookstore instead of buying an ebook. But covering up some of the art or photographs creates yet another benefit to buying books online—getting an unblemished copy. I’ve yet to buy a book at Amazon that put a sticker on the cover art or author photo. Buffalo, Texas: The Horse’s Mouth on Highway 79 last modified March 1st, 2018.